Use your imagination to picture the early humans eating these Original Caveman Cookies! We bet they were really into the traditional oatmeal-raisin cookies and they really have enjoyed stuffing with them! 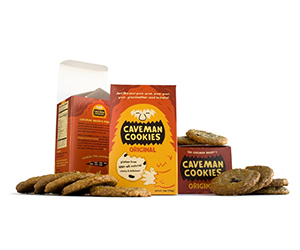 The Caveman biscuits are so chewy and delicious, and the other good news is they’re dairy, gluten and grain free, plus there isn’t any refined sugar or preservatives. You’ll enjoy the good taste of honey, berries and nuts. Don't miss also the other totally delicious Caveman Cookies.